Shinedown’s sixth studio album ATTENTION ATTENTION has an anger, the beats are raw, guitars are gritty and the lyrics? They are bitter, hard to listen to at times as the album addresses melancholy, loss of hope and mental health. They get your attention by weaving deep lyrics that embolden the words that you listen to and digest the meaning. This is an album that drives deep into your consciousness with every listen. The fourteen track album is full of authentic pain, it is real giving the album an intricate power that cannot be created and has been felt by the musicians as they deliver the music they want you to hear. The message is personal as we follow an individual facing their demons, through the soaring highs and plunging lows the anxiety and panic are there in the melodies, as the album opens a door into a personal world. This they create with a knock, a squeaky door opening and squeaky steps warily walking, a sigh and deep breath and we are plunged straight into the opening track DEVIL, which does what all first numbers should do and often don’t do. It sets the scene with true opening power and a taste of what is to come. The close of the track with electronic sonics leading perfectly into the electronic keys as we explore DARK SOUL. Heavy, prowling, dark and energized on an album emotionally charged with lyrics that provide a meaningful narrative that leaves you moved. The delivery of Brent Smith’s vocals are superb, bold, tuneful and they are a clarion call to listen, understand and take action. Mental Health affects us all, there is no escape from the darkness that can envelop anyone at any time. The highlight of the album is KILL YOUR CONSCIENCE it is pure unadulterated Shinedown power. Stinging drums, curling guitar riffs and words that sear deep into your soul you cannot fail to be moved. The beat is angry driving full of complexity as feelings are confused and this destructive feel is captured across the music. There will be many songs about the power (destructive so often) of social media on how we live and see the world. This is the best so far keep it real and actually talk to people face-to-face it is restorative. The beat speeds up as the doves cry and the sonic shapes are distorted on PYRO, a track where the band’s energy is on fire as they set fire to the Family Tree. This is the sound many would have expected to dominate the album it links the latest with the past. We need a ballad and GET UP delivers this feel. This is dripping in change something has happened the feeling is upbeat, moving forward there is light at the end of the darkest tunnel you just have to keep moving. Followed by the only track, not in capitals, special. ‘You’re not special, stop waiting on your fifteen minutes of fame’. This is we are all in this together, happy, unhappy looks at the self-destructive path of alcohol. Powerful chorus and chanting of get up this is a call do not take yourself so seriously join the world and all its complexity. The album re-emerges with a different tonal shape with The Human RADIO full of distortions this is rock that has a modern edge we can survive it will take a fight that will succeed if we do it all together. The bass lines are stunning and we get the message we are humans and should be interacting. Closing the album following BRILLIANT the door opens they walk away with see you next time, upbeat and not a squeak to be heard, Why the album has delivered the musical equivalent of a healthy dose of WD40. What sets ATTENTION ATTENTION from the plethora of rock albums are threefold. They have something to say and are proud to deliver their concept message loud and clear there is no softening of the message or ambiguity. Mental Health is complex and we all need some help and support sometime in our lives. The strength is in the lyrics, pulling you deep into the storylines that you want to hear and explore. The music ebbs and flows always stamped with Shinedown’s stamp but they change the tempo, approach with different textures and sonic ranges. Last but not least, they are continuing to develop they have not allowed themselves to be trapped in a style and musical approach that has worked before. They have taken a risk stepped away from the formulaic and it is a stupendous success. These are the elements that when pulled together by the soaring anthemic driving chorus’. Shinedown you definitely captured we heard what you are saying you have our attention and when we stop listening we will Get out and talk to real people. Shinedown Rock Capturing your attention with New Album Release, Bluesdoodles apologies for tardiness in writing the review listening was too rewarding. 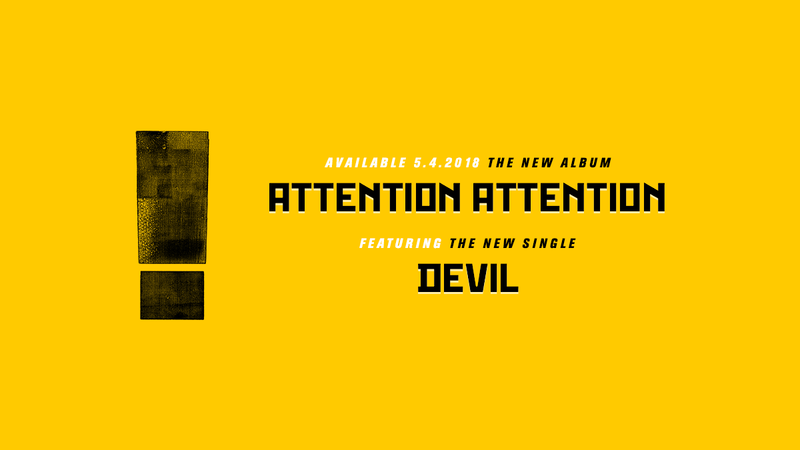 Shinedown with the release of ATTENTION ATTENTION on 4th May released rocking sunshine for Bank Holiday weekend across the U.K.
Concept album and Shinedown may not be a phrase you expect to read. Rest assured the phrase suits this rejuvenated Shinedown their best album produced to date and the trajectory of the band is definitely set to fly high. ATTENTION ATTENTION is Shinedown taking on a new shape they created an album that will be on people’s lists of favourite albums in years to come. Yes, you have our full, undivided ATTENTION ATTENTION. In-house Eric Bass Produced and mixed the album. SHINEDOWN begin a world tour in March in the US. The band hit UK shores this summer, playing a main stage slot on Sunday 10th June at Download Festival. A UK headline tour is expected toward the end of the year.